An early Christmas present has arrived from the DabbleDB team for the 100 million or so of us that have to work with data on a day to day basis. They’ve created a do-what-I-mean web tool that lets you show how you want data to be restructured and bang! it’s done. Check out the video. It’s a great idea and a elegant, easy to use interface. There are so many directions I’d love to see them take this tool. 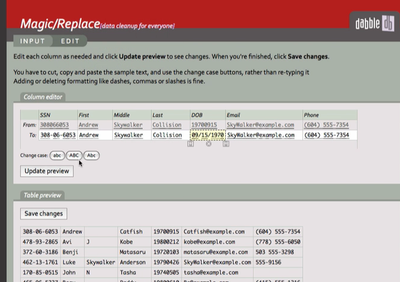 Cleanupdata is a great name, but they’re really giving you better ways to restructure data. This tool won’t help you find and fix errors and anomalies in data. At least not yet. I also hope they extend cleanupdata to let people automate these data restructuring operations. If only you could apply a cleanup created in cleanupdata.com to 1,000 Excel spreadsheets or to a database table. If you like this, it’s worth checking out DabbleDB. They have rethought the database with a database/spreadsheet/web forms/visualizer platypus of a tool. It lets your data be pliable in ways that databases don’t allow, while retaining structure that spreadsheets don’t recognize.